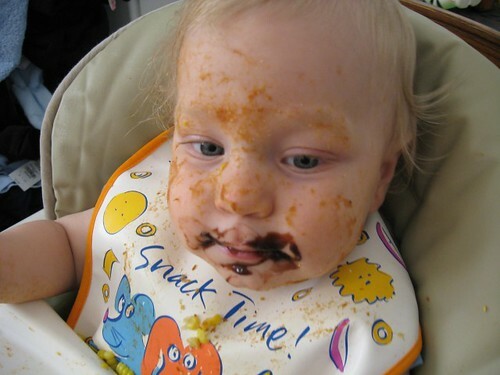 So what happens to a sweet smelling one year old boy when he is given baked beans to eat? 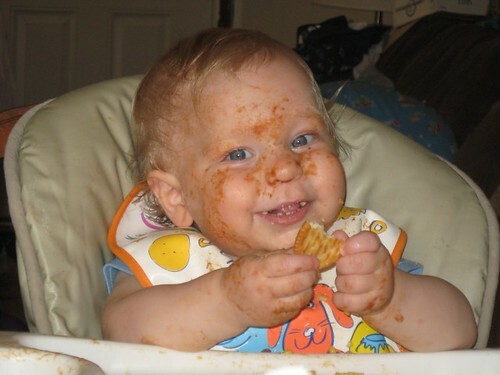 A HUGE mess is created! 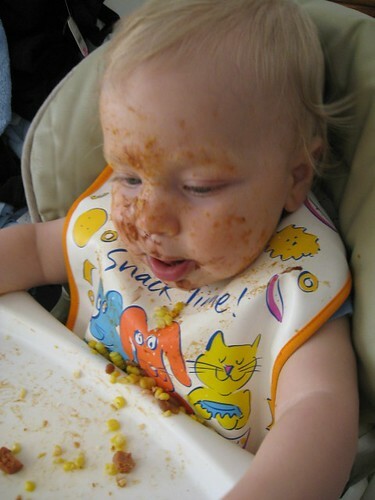 Lucky for us most of the mess was on JSL’s face and hands, the rest was on his bib and tray. Thank goodness he did not throw this part of dinner because it would have been very bad. As mentioned baked beans was one of the items given to JSL for dinner last night. 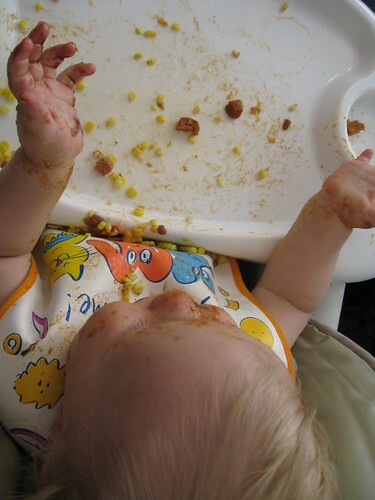 He also had a veggie dog (mainly pitched onto the floor and down the hall), corn off the cob and some crackers. 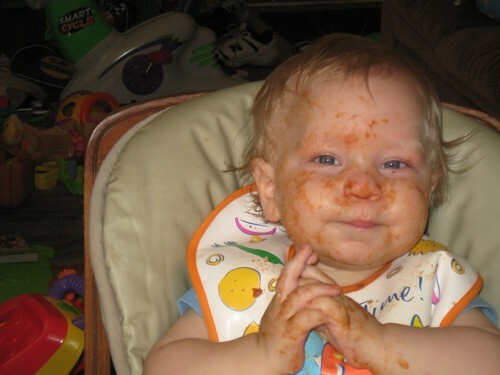 He loved the baked beans and gobbled them up. I guess he was a little shy. 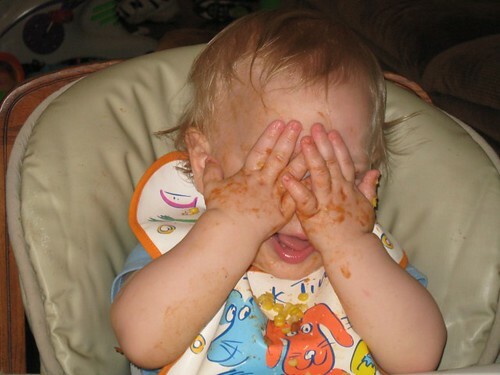 That or he wanted to make sure he got some baked beans on his eye lids too. Apparently that is the rage in the two and under crowd! As JL and I were trying to figure out how to tackle the kiddo into the tub he just sat there smiling and giggling at us. He certainly had no clue what a frightening task this was for all involved. Finally he asked for a "crackah" and some "wah wah" to go with it. 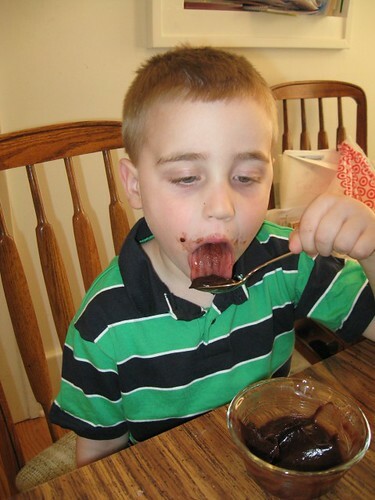 While JL was off getting the bath ready I decided to feed the boys some chocolate pudding that NHL made. 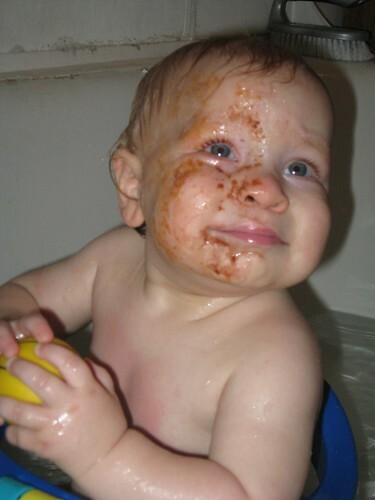 This was the first time JSL had pudding and he really seemed to enjoy it (seriously he did – this photo does not show him growling for more). The layers of grime were starting to get crusty so it was since to get the boy into the tub. Here is a view of a clean part of the child. Not everyone at the table was wearing their meal, well at least not most of it. NHL was definitely much cleaner than his little brother. 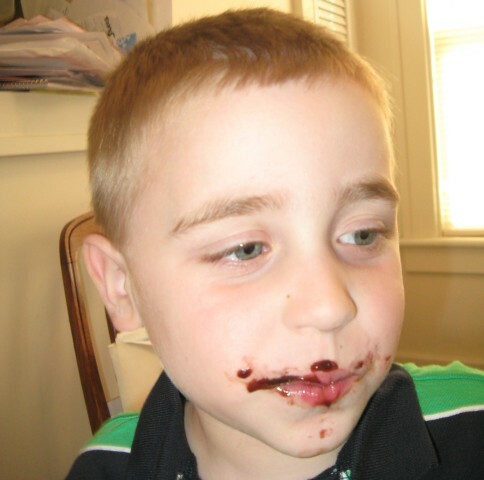 This photo almost made me cry – my baby is all grown up and going to kindergarten in the fall. Finally the tub was ready for the little monkey, so one last photo of the mess before it was time to get all of the food off. 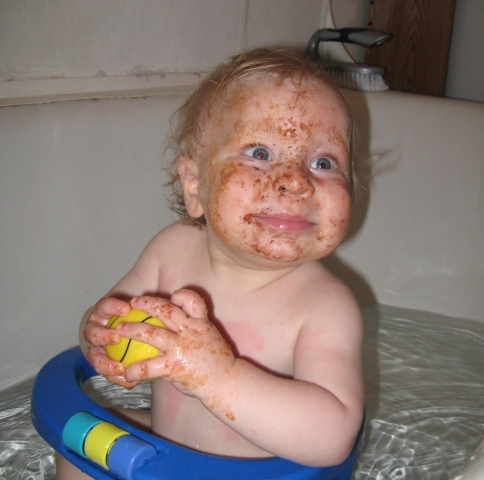 For some reason it looked a lot worse once he was sitting in the tub about to get cleaned. 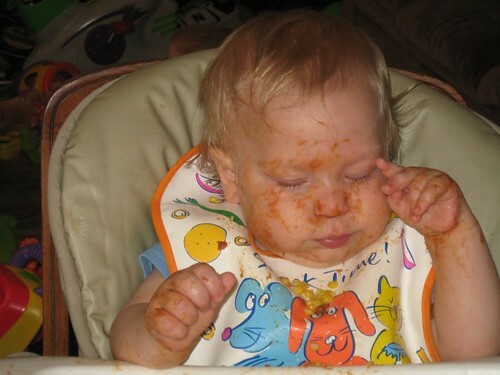 Thank goodness I only had the little guy in a onesie for dinner – it made stripping him a lot easier. The good news is he is still clean tonight and sleeping (for now at least thanks to major teething). 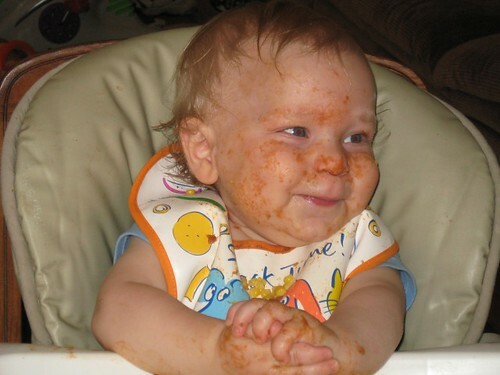 The bad news – he loves baked beans and we will likely have a repeat performance eventually. haha JSL looks so proud of himself! LOL I love it! Those photos are TOO CUTE!! !